Ryan Beeson, of Beeson Outdoor Adventures ™, brings the adrenaline rushing thrill of your most exciting hunts to life well after they have been etched into your memory – and soul – forever. Using an amazing “Wild Canvas”, Beeson captures incredible wildlife scenes that will be the envy of your hunting buddies for generations to come. Whether you fall in love with one of his original creations, or want to capture your own memories in a custom piece, you won’t be able to pass this work of art on your wall without a few seconds – or minutes – lost in the scene. “My enthusiasm for hunting is not just a passion, it is truly a way of life. I live the outdoors every single day and when I’m not pursuing my own hunts or introducing a kid to the hunting life, I live it through my artwork. It just so happens my canvas of choice is slightly unique!”, says Beeson. 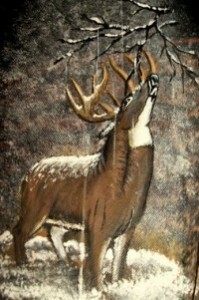 One of his most popular works of art are wildlife scenes on wild turkey feathers or full mounted fans. 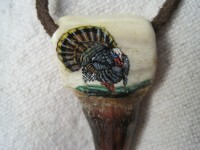 If that isn’t enougt to to get your blood pumping, how about a gobbler in full strut painted on a single turkey spur?! CLICK HERE for amazing Products from Beeson Outdoor Adventures! These priceless works of art do not last long! While Central Iowa is home to Beeson Outdoor Adventures, their reach extends beyond Hawkeye Country. Beeson himself has hunted from the gentle hills of southern Ohio to the swamps of Florida and the remote wilderness of Alaska. He has previously guided hunters on remarkable pursuits including Monster Whitetails, Turkeys, Waterfowl, Moose, Brown Bear, Black Bear, Caribou – - you name it, he hunts it. Check out Beeson Outdoor Adventures products and services at the Outdoorsman’s Country Store .